Live Webcams Prague - The Best City View! Live webcams Prague – the best city view! Best live webcams in Prague allow you to see a one of Europe’s most beautiful cities in real time mode. Prague – ancient capital of the Czhech Republic. And it is a true open-air museum. 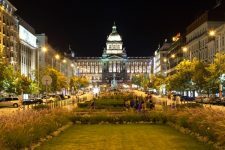 On this page presents the most interesting webcams in Prague, which today are characterized by stable performance and good quality video. Main city attractions: bridges, churches, temples, plazas, panorama – all this you can see with the help of Prague live webcams installed in the most popular tourist places in the city. To ensure that all interested persons could make a full and exciting virtual journey into the European capital, for each of the live webcam Prague there is a description of the places in the city where this webcam was installed. This approach allows us not only to see interesting places in Prague, but also to get information about their location and history. Of course, webcam-travel.com is not an encyclopedia, but rather entertaining resource, so for more information about the city, you can easily find on other sites in the network. The best time for viewing of all live webcams in Prague – is the light day, when most complete detail of objects. However, Prague is a modern European city with a good night illumination, so you can view webcams from the Czech capital at any time of the day. By the way, in some cases, night view no worse day. 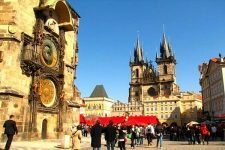 For example, if you look live webcam Prague in the winter, when the city’s main square is decorated Christmas tree, and all the main streets of the capital are decorated with brightly colored garlands. If you do not live in Europe, do not forget about the time difference between your country and the Czech Republic. Broadcasting of live webcams Prague provide a many company, so there is no uniform rules for viewing. Some webcams are started automatically after you open the page. And some others – only after you click on the play button in the center of the screen. Also, you may notice that some of the cameras transmit a full size live video, and some – only slideshow. Finally, a few cameras is the panoramic and allow you to see much more of the cameras that focus on any one object in Prague. 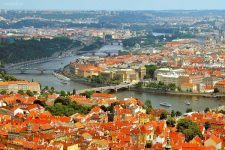 Currently you can find 6 live webcams in the list of the best Prague webcams, each of which is available on a separate page. This allows faster download video broadcast and saves your traffic. To open the online camera that you are most interested in, you have to click on its name (the active link). And after you finished to watch, you can either return to the main page, or make a quick transition to the following web cameras with a single click – at the top of the page above the playback window. Please note – some webcams not begin work at once – sometimes you have to wait 5-20 seconds before the broadcast. One of the best Prague webcams, which provides real-time video broadcast from the very center of Prague. The popularity of this webcam is caused not only by the fact that with the help of it you can see the famous Charles Bridge over the Vltava River, and is located on a high hill Prague Castle. Incidentally, this castle is officially listed in the Guinness Book of Records as the largest castle in the world. At present, on the territory of the castle is the residence of the President of the Czech Republic, but anyone can visit this place and enjoy the magnificent Gothic cathedral of St. Vitus Cathedral, and stroll around the many streets and squares of the castle complex. Big advantage of this live webcam Prague – that she panoramic. The camera periodically turns to the right and to the left, so you can see as many objects on the left bank of the Vltava River in Prague. With this web cam in Prague you can admire the historic center in capital of Czech Republic, which is the most popular holiday destination for many tourists and guests of the city. And you can do it in real time. According to many reputable travel publication, The Old Town Square in Prague is the most beautiful square in Europe, because it is a complete ensemble of architectural buildings and monuments, which nevertheless belong to a completely different styles: Gothic, Baroque, Renaissance, Rococo. In spite of such a mixture of architectural styles, everything looks very harmoniously and solemnly. Old Town Square with the surrounding buildings is one of the major national cultural monuments of the Czech Republic. Directly into the lens of this webcam of Prague gets only part of the area and one of its main buildings: the town hall, built in the 14th century. Very interesting webcam Prague, which is located in the historical center – the Old Town Square. In contrast to the previous web camera, with which you can see only a small part of this area near old town hall, now you can see overview of a much larger and you can see in real-time about 80% of the historic main square. Webcam installed on the facade of the Lippert Hotel, so if you want to stay in the center of Prague and enjoy this view directly from the window of his hotel room – you can order it via this link at the best price. Webcam starts automatically after loading the page. In some cases, you need to wait 5-15 seconds to load the video player and the beginning of the video broadcast from the center of Prague. In the central part of the square, just in front of the webcam, there is a large sculpture with a fountain. This is a monument to the national hero of the Czech Republic, which was the main ideologist of the Czech Reformation, priest, preacher, and one of the greatest scholars of his time. This is one of the most unusual Prague webcams and even in Europe. Its main feature is the constant change of perspective. It means, the camera constantly rotating (with small breaks) and zoom makes the most interesting in the capital of the Czech Republic facilities. The number of objects for viewing is not three, not five, or even ten, for twenty! Web camera work is accompanied by pleasant classical music, which is the volume you can adjust using the virtual buttons located at the bottom of the video player . I am sure you will easily cope with it, because the work of this online webcam Prague organized with the help of Youtube video service from Google, which everyone is familiar. Some disadvantage of this web camera mounted on one of lighting a match in a stadium Strahov district – is trembling image. This is due to the presence of the wind when you install webcams at high altitudes, as well as a very large zoom. 5. Charles Bridge in Prague – live webcam! Charles Bridge – is a famous bridge over the Vltava river in Prague, which connects the districts of Prague Stare Miasto (Old Town) and Malá Strana – «Prague’s Lesser Town.” Built Charles Bridge, which is visible in the foreground of this live webcam Prague, in the Middle Ages. The first stone was laid at the base of the majestic bridge in 1357 by King Charles IV, in honor of which later got its name (originally called simply The Prague Bridge). Charles Bridge up to now preserved in excellent form, and during construction was a masterpiece of medieval building. Consisting of 16 powerful arch stone bridge decorated with 30 sculptures, mainly of religious subjects. With this live webcam in Prague you can not see in high quality a sculptures on the bridge, but the fact that many of them have been preserved in almost original form inspires respect for the medieval masters. With this Prague webcam you can see the famous Wenceslas Square in Prague – central to the town, which is loved by all the locals, and is on the list of places of compulsory visits for tourists. But this webcam allows you to see only part of famous square, because Wenceslas Square in Prague – one of the largest squares in Europe. At the moment on the square (which has a length of 750 meters and a width of 48-63 meters) is located about 60 buildings. The central object, which you can see online around the clock – the National Museum. This magnificent building, against which always turn out great photos for your travel album. 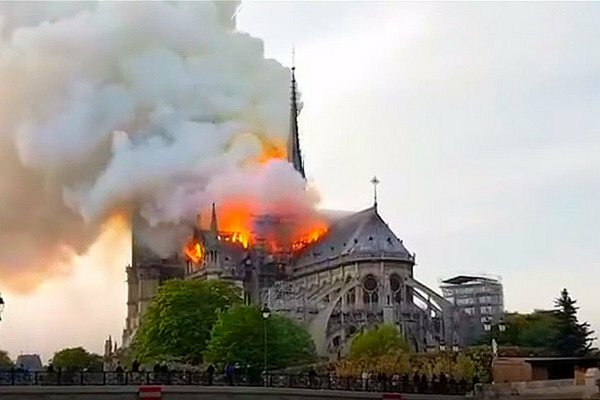 However, for several years, the building is under restoration, so its facade and dome in scaffolding, that a few spoil the overall impression of the building shape. If you know one or several others interesting live webcams in Prague – please, let us know about it in the comments on this page. I wish you all a pleasant watching and a memorable trip to Prague! Thank you for the webcam! I was happy to see Prague online again! You are welcome! Enjoy watching! A good list of webcams! I love Prague, so I added this page to my favorites! Thank you! Nice view! Prague is one of my favorite cities! I agree! A good city for living and recreation! Therefore it is always a pleasure to watch live webcam Prague!